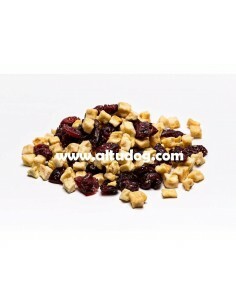 100% Natural of apple cranberries dehydrated at low temperature. Cranberries: One of the most outstanding properties of the cranberries is its high content of antioxidants, being one of the best fruits to prevent the appearance of diseases related to the heart in our dog. They are also rich in vitamin C and fiber. With a high antibacterial capacity. It helps fight diseases of the urinary tract and the formation of stones. It also contains a high antioxidant capacity helping in tissue repair. 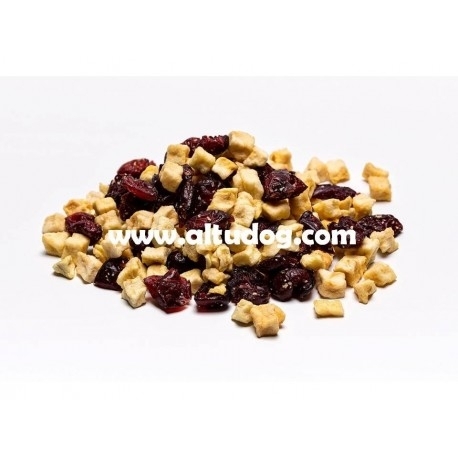 Apple: Both for its digestive and astringent properties, are ideal for treating diarrhea in dogs and other stomach problems, such as its high content of vitamin C, calcium and anti-inflammatory properties, the apple is a very good fruit for our dogs. It contains pectins that acts as soluble fibers improving the intestinal tract, besides being a source of amino acids.